The first thing visitors notice is a huge map in the ceiling of the spacious station hall, executed in shades of delft blue. This famous ceramic was also the inspiration for the cladding on columns and walls. The result was a modern take on Gaudí, with pieces of broken tiles in the same shades traditionally used in delft blue ceramics. It's finally happening: Delft's old railway station is being repurposed. 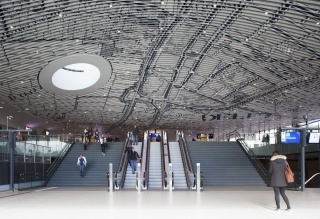 The new station is an architectural beauty, with an eye-catching use of ceramic. The construction site for the new station was off limits to the public until late February. But finally everything was ready and Delft's new railway station opened its doors. It was instantly clear that the architecture firm Mecanoo had pulled out all the stops to make sure that the historic legacy of Delft, the traditional seat of the Prince of Orange, was reflected in the design. This was a concept that Mecanoo took seriously, because the architecture firm is also located in Delft, not far from the new station. 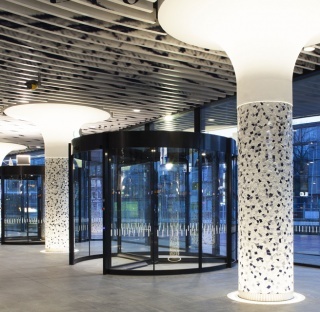 In the design phase, architect Francine Houben played with the idea of making the columns entirely out of ceramic. Given the organic shape of the station hall, putting ceramic cladding on the columns all the way to the ceiling would have meant using tiles with a three-dimensional curve. That would have been extremely difficult to achieve and unreasonably expensive. A mosaic was the best solution for giving the trumpet-shaped columns a modern interpretation of delft blue ceramic. The most logical option was to work with traditional mosaic tiles, but that implementation wouldn't have suited the image the architect had in mind. She felt that broken mosaic, famously used by Gaudí, was the best solution. "She felt that broken mosaic, famously used by Gaudí, was the best solution." In the design phase, Mecanoo worked with Mosa to put together the right tile combination. The goal was to create an association with delft blue ceramic in travellers' minds. To this end, the architectural firm researched the proportions of the various shades of blue in combination with white in original delft blue ceramic. The final result was 58% white and 42% blue, spread out among light, medium, and dark blue. The starting point was Mosa's famous Colors series (6 x 6 inch), which many architects use as a finish in toilet groups and kitchens. Here in Delft, the series was used in an entirely new way. In consultation with the tile producer, Mecanoo indicated what sizes they wanted the pieces to be. In the first version, several sharp edges stuck out past the smaller circle formed by the cylindrical columns. In those instances, smaller measurements were needed. "The result is lively yet harmonious." When it came time to apply the tiles, the question arose of who would break the tiles and how a pattern could be achieved that was as even as possible. The idea of delivering loose tile pieces was quickly rejected. Mosa would need to solve the issue at its headquarters in Maastricht. There Mosa broke the tiles, selected them on the basis of size, and glued the pieces together in the right proportions to form mosaic tiles measuring 12 x 12 inch. When the tiles were tested on location, the nets could be clearly seen. Mosa adjusted the edges so that the tiles touched each other in such a way that the nets were no longer visible. The result is lively yet harmonious. It is a modern interpretation of delft blue ceramic in a down-to-earth Dutch manner. The flamboyant approach favoured by Gaudí would have looked out of place in a Dutch railway station annex municipal offices. The fact that the tiles were delivered on mats also proved to be important for the application of the tiles. This enabled the tiling company Unimar Tegelwerken to complete the entire project in nine weeks using just two people. If the tiles had been delivered loosely that would never have been possible. The architect also wanted the joint to be as small as possible. This was also something that was easier to achieve in Mosa's 'mosaic lab' than at the construction site. The work on the station is now finished and the station has been opened. But that doesn't mean that the entire project is complete. There is still work to be done on the adjoining municipal hall, which will be directly connected to the station hall. More of these special columns will be created in the second phase, and they will receive the same modern delft blue cladding. This finish was given to 3,659 sqf in the first phase; the second phase will see an additional 1,829 sqf with this finish. The tiling work in the municipal hall is planned for mid-2016. The entire project, including offices and infrastructure, is planned to be completed in 2017. Completion: Design 2006-2010. Construction 2012-2017. Railway station opening on 28 February 2015. Completion in 2017.